L-R: Sen. Shimabukuro and DOT Deputy Director – Highways Division, Edwin Sniffen. On Monday, 09/12/16, DOT will participate in a Town Hall meeting to discuss the Nanakuli contraflow project and other traffic solutions. The meeting will be held at the Ka Waihona o Ka Na’auao cafeteria from 6:30-8:30pm. Refreshments will be served starting at 6:30pm, meeting starts at 7pm. I have received questions about the recent news of the highway widening project not being funded. Fortunately, this does not impact the current turn lane project, ie, eastbound turn lanes at Haleakala Ave. and Nanakuli Ave. The turn lanes are still funded and scheduled to finish next year. Included with the turn lane project are the contraflow operations, and traffic cameras being installed at the first four intersections in Nanakuli. The highway project that is on hold for now due to the gas tax bill not passing is a potential widening which extends to Hakimo Rd. Fortunately, DOT is still conducting a study of the feasibility of adding a 5th lane on Farrington Hwy to try to ease the Nanakuli bottleneck. Mahalo for the privilege of serving you. Contact my office if you have any questions or concerns, at 586-7793. A CIA is required for the proposed 20-unit Single-family Residential Subdivision Project at 86-029 Farrington Highway as part of the Environmental Impact Statement (EIS) process. We are requesting assistance in locating people knowledgeable about traditional cultural practices associated with the vicinity of the proposed project, located on approximately 3 acres of lands comprised of two contiguous parcels Lot 490-B-1 (2.785 acres) and DLU Lot A (0.39 acres) situated south of Lualualei Homestead Road and east of Pōka‘i Bay Drive, and is identified by Tax Map Key (1) 8-6-015:053. Several maps of the project area are provided as attachments. prepare a report on the findings resulting from the above investigations. It is that time of year again! This is the fourth year that we are having a high school essay contest as part of the Pro Bono Celebration to be held on October 27, 2016. Every year has been a success so far, so let’s keep it going! Please feel free to distribute the attached entry form and essay contest flyer. As in the past years, we are looking for volunteers from the DLSP committee to (1) be preliminary judges, and (2) follow up with the schools to help spread the word about the essay contest (we need the most help with this). Please let me know if you can assist. Thank you!!! We would like to have at least 18 preliminary judges, so please let me know if you are willing to be one. I know that some of you have already expressed your willingness, but please confirm. We have already e-mailed and mailed the essay contest packet to all of the principals, and we have also e-mailed all of the teachers whose students submitted essays from 2013-2015. However, it would be great if we had at least 10 volunteers to follow up directly with the schools and their administration/teachers to make sure that they received the essay contest packet, since entries are due by September 22, 2016. Attached is a list of the ~100 high schools from across the state. In particular, we are looking at encouraging neighbor island participation, so it would be great if the neighbor island attorneys could assist with the calls. Thanks to Derek, Lynda and Scott for volunteering so far! The Waianae Moku 2030 Navigators, a community planning group created in August 2015, is hosting a community business development planning summit, Living Westside, on August 27, 2016 at the Old Kress location in Waianae Mall. The summit will bring together community leaders, business people, and interested Waianae Coast residents to identify community projects that support community business development on the Westside. 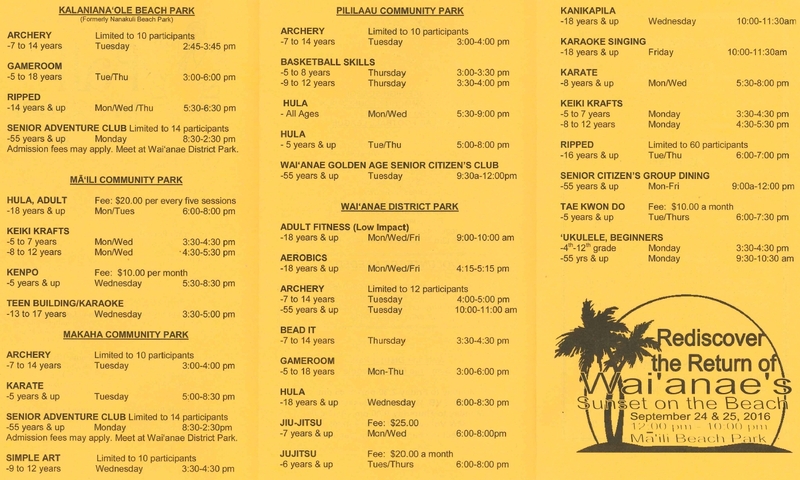 The initial core planning team members includes representatives from the Waianae Coast Comprehensive Health Center, Waianae Coast Hawaiian Civic Clubs, the Waianae Coast and Nanakuli and Maili Neighborhood Boards, the Queen Liliuokalani Children’s Center – Waianae Unit, OLELO Community Television, various businesspeople and community residents. At this Summit, the Navigators, will present their planning process, share priority projects that are launching in 2016 as well as consider businesses for sale options, and get community input on future priority projects that address community needs and aspirations to be launched in 2017. Waianae Moku 2030 Navigators is a project of the Waianae Economic Development Council. The summit is sponsored by the Queen Liliuokalani Children’s Center.